In a large pot of boiling, salted water, cook the penne until just done, about 13 minutes. Drain, rinse with cold water, and drain thoroughly. 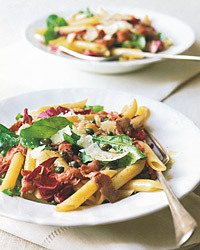 In a large bowl, toss the pasta with the arugula, radicchio, capers, oil, vinegar, salt, and 1/4 teaspoon of the pepper. Add the roast beef and toss again. To serve, mound the salad on plates. Top each with strips of Parmesan shaved from the chunk of cheese with a vegetable peeler or with the grated Parmesan. Sprinkle the remaining 1/4 teaspoon pepper over the salads. This salad goes well with many simple, fruity reds. Pour a Beaujolais-Villages or try a red wine from the south of France such as Corbières or Coteaux du Languedoc.